Brings back memories of my father's Zorki 4, and my own Zenit ET. Thanks for putting all that effort. It is appreciated. I have a Zorgi 6 PM2050. I used it about 20 years but not anymore. Laba diena. Turiu tokį daiktą (станок контактной печати кп-7). Niekaip nesiseka rasti daugiau informacijos. Gal galite padėti? All type-1 cameras have an unique feature - the lightmeter has no edges of rigidity! What the hell does this mean? Edges of rigidity? That makes no sense at all. 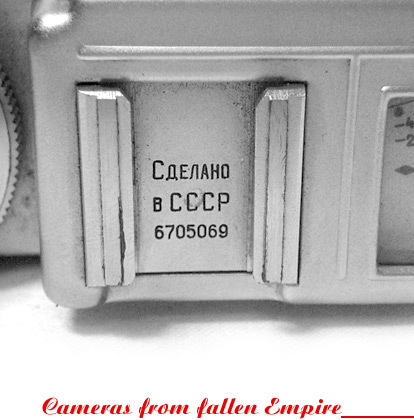 I want ot use russian camera! FANTASTIC.. One of the most interesting camera sites I have yet to visit.. Kudos. Здравствуйте. Огромное спасибо за сайт.Имею фотоаппарат ФЭД НКВД-СССР Харьковский комбинат имени Ф.Э.Дзержинского № 121239. Хотелось бы продать, интересует реальная стоимость.Спасибо. Hi, I have surely got to state, I enjoy your website. The colours, the format, the entire style, all of them go completely together. Anyway, that's all I really had to state.